Short stays in English hospitals: on the rise? In an interview with the Daily Telegraph, the new head of NHS England described his vision for community care, saying that too many people were spending short spells in hospitals because of preventable illnesses and injuries. The source of the claim is a report from the National Audit Office (NAO), which says that the number of 'short' hospital stays - those of less than 2 days - that have come about after an emergency admission has risen 124 per cent over 15 (not 14) years. Other figures show the average stay in hospital has become shorter over the period. And analysis by the Nuffield Trust has shown that between 2001 and 2009 the rise in short stays from emergency admissions was not matched by a rise in the number of longer stays. The data covers patients who either stay in a hospital bed overnight, or who were originally expected to when taken into hospital. This includes people with scheduled overnight stays following things like operations, and people staying overnight after being admitted in an emergency. 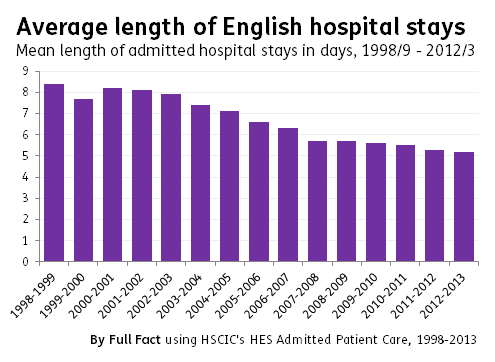 The mean length of a hospital stay fell by 38.1% from 8.4 days in 1998-99 to 5.2 days in 2012-13. The median average stay has fallen from two days to one. You could be forgiven for thinking this reduction in the average amount of time people are spending in hospital is unambiguously positive; it might show that people are being treated more quickly, for example. But this isn't necessarily the case. It could simply reflect, as Mr Stevens seems to be arguing, a change in the types of ailments and illnesses that are resulting in hospital admissions, or that not enough care is being provided in the community. In 2010 the Nuffield Trust used a more detailed version of the same dataset to sort emergency admissions by the length of the hospital stays they resulted in. Its analysis shows the number of emergency admissions to hospital that led to a stay of less than two days more than doubled between 2001-2009. The number of longer stays remained relatively flat over the period. The NAO said in their report that in the 15 years up to 2012-13, the number of stays rose by 124%, compared to 14% for longer stays. Updated to include the source of the claim, and further information from that report. How many NHS trusts are in the red?